2. But then we wonder: Is this the world in which we are living? Creation retains its beauty which fills us with awe and it remains a good work. But there is also “violence, division, disagreement, war”. This occurs when man, the summit of creation, stops contemplating beauty and goodness, and withdraws into his own selfishness. When man thinks only of himself, of his own interests and places himself in the centre, when he permits himself to be captivated by the idols of dominion and power, when he puts himself in God’s place, then all relationships are broken and everything is ruined; then the door opens to violence, indifference, and conflict. This is precisely what the passage in the Book of Genesis seeks to teach us in the story of the Fall: man enters into conflict with himself, he realizes that he is naked and he hides himself because he is afraid (cf. Gen 3: 10), he is afraid of God’s glance; he accuses the woman, she who is flesh of his flesh (cf. v. 12); he breaks harmony with creation, he begins to raise his hand against his brother to kill him. Can we say that from harmony he passes to “disharmony”? No, there is no such thing as “disharmony”; there is either harmony or we fall into chaos, where there is violence, argument, conflict, fear …. 3. At this point I ask myself: Is it possible to change direction? Can we get out of this spiral of sorrow and death? Can we learn once again to walk and live in the ways of peace? Invoking the help of God, under the maternal gaze of the Salus Populi Romani, Queen of Peace, I say: Yes, it is possible for everyone! From every corner of the world tonight, I would like to hear us cry out: Yes, it is possible for everyone! Or even better, I would like for each one of us, from the least to the greatest, including those called to govern nations, to respond: Yes, we want it! My Christian faith urges me to look to the Cross. How I wish that all men and women of good will would look to the Cross if only for a moment! There, we can see God’s reply: violence is not answered with violence, death is not answered with the language of death. In the silence of the Cross, the uproar of weapons ceases and the language of reconciliation, forgiveness, dialogue, and peace is spoken. This evening, I ask the Lord that we Christians, and our brothers and sisters of other religions, and every man and woman of good will, cry out forcefully: violence and war are never the way to peace! Let everyone be moved to look into the depths of his or her conscience and listen to that word which says: Leave behind the self-interest that hardens your heart, overcome the indifference that makes your heart insensitive towards others, conquer your deadly reasoning, and open yourself to dialogue and reconciliation. Look upon your brother’s sorrow and do not add to it, stay your hand, rebuild the harmony that has been shattered; and all this achieved not by conflict but by encounter! May the noise of weapons cease! War always marks the failure of peace, it is always a defeat for humanity. Let the words of Pope Paul VI resound again: “No more one against the other, no more, never! … war never again, never again war!” (Address to the United Nations, 1965). “Peace expresses itself only in peace, a peace which is not separate from the demands of justice but which is fostered by personal sacrifice, clemency, mercy and love” (World Day of Peace Message, 1975). Forgiveness, dialogue, reconciliation – these are the words of peace, in beloved Syria, in the Middle East, in all the world! Let us pray for reconciliation and peace, let us work for reconciliation and peace, and let us all become, in every place, men and women of reconciliation and peace! Amen. 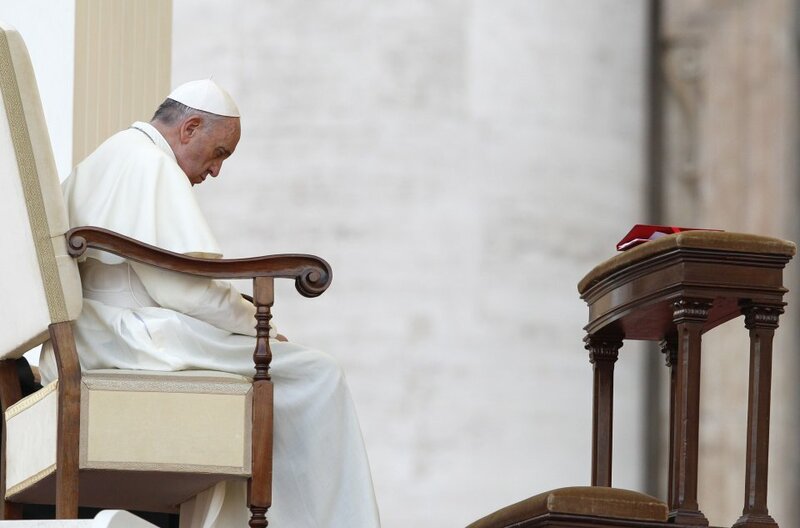 This entry was posted in Pope Francis, The Church, Uncategorized and tagged homily, meditation, Pope Francis, Prayer Vigil for Peace, Syria by texasnuns. Bookmark the permalink. Words to be read, not just today, but everyday! So powerful! Thank you, dear Sisters! And may God continue to bless our Holy Father!